DIAMOND CREEK - Drive either Buck and Doe Road (on the Hualapai Reservation) or Antares Road to Peach Springs (capitol of the Hualapai Indian Nation). You must get a permit from Hualapai Fish and Game to drive 21 miles to the only place that you can reach the Colorado River on the South side. WILLOW BEACH - 76 miles from Meadview at milepost 14 off highway 93. Boat ramp and fishing. Excellent scenery of Colorado River 11 miles below Hoover Dam. Willow Beach now has a beautiful campground, fishing and boat docks, rental boats, and a big supply marina store. After a flood washed out the older store and motel, NPS contracted with another concessionaire to really spruce up the place. Click on for info. GRAND CANYON CAVERNS - Take Antares Road (not paved) to Route 66 and drive the entire way 10 miles east of Peach Springs. An alternate route, would be Stockton Hill Road to Kingman, (and it is PAVED). Go east on Route 40 to the next exit (Andy Divine) go left on Andy Divine to Peach Springs. The Caverns are approximately 10 miles East of Peach Springs.. It is the largest dry cave in the US, 95 miles from Meadview. It is a fee area. An elevator drops you 210 feet to the floor of the cavern. Only 3 out of every 100 caverns in the world are dry. This makes the Grand Canyon Caverns very unique. Click on for a peek. HUALAPAI MOUNTAIN PARK - 8300 feet in a pine forest. Lower southern end has saguaro. Many famous mines within the 40 mile length of the range can be visited. On eastern slope is the Gold King Mansion. Click on for info. GOLDROAD / OATMAN - 1900 boomtowns - gold mines (one still in operation). 100 miles from Meadview through Kingman to exit 44 on I-40. This is the old route 66. Cross Sacramento valley, climb the volcanic Black Mountains. Visit the hotel where Carole Lombard and Clark Gable spent their honeymoon. Click on for info. BRECHNER STONE CABIN - Turn onto Gregg's Hideout Road from Pearce Ferry Rd - cabin is located to the left beyond the Temple Bar turnoff. Dated 1859. You need a guide the first time to locate the cabin. TEMPLE BAR VIA BACK ROAD - Take Bluebird Canyon down to Hualapai Wash, backtrack to Gregg's Hideout Road, watch for sign at Temple Bar turnoff. Follow dirt road to Temple Bar or turn off Pearce Ferry Road onto Gregg's Hideout Road and watch for Temple Bar turnoff. 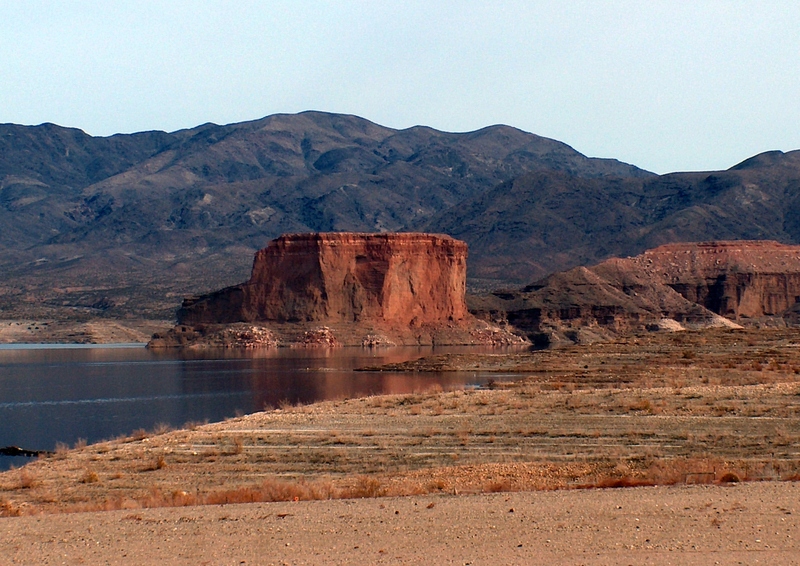 Interesting mines, views of Lake Mead. Click on for info. 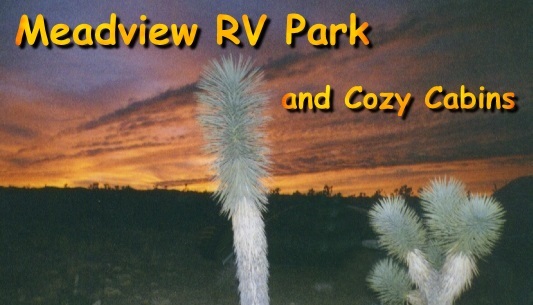 GRAPEVINE WASH / SPRING HIKING TRAILS / ROASTING PITS / PEARCE FERRY / DRY FALLS / GYPSUM CLIFFS -East on Meadview Blvd. in Meadview, turn right on Shore and left onto BLM 145. Follow road north into wash, pass Lucky 7 windmill, turn right into next wash then right again to find Anasazi Yucca Roasting Pits. 1/2 mile south of Grapevine Springs turn right into Lost Cable. A 6 to 6 1/2 mile hike to Dry Falls and the two canyons in back. Hike up Grapevine Springs Canyon but be prepared to climb up three small waterfalls. Gypsum cliffs on both sides of wash 2 miles north. Pearce Ferry Landing can be reached if you continue to the north arriving at the lake edge. Over the ridge is what is left of a mining site. Grapevine wash was known as the Old Ute Trail, and was used for hundreds of years by the Anasazi Indians crossing the Colorado River. They either turned left at what is now the Diamond Bar Ranch to travel to the Hopi Mesa, or right to go to California. SECRET PASS / HIDDEN ARCH - From highway 68 turn left on Estrella. Turn right and follow dirt road. Secret Pass entrance is difficult to find but the hike is fantastic. This is the trail used from Mineral Park into the Oatman area mines. Further down the road turn left and park. Hidden Arch is up in the heavy rock formations above the parking area. You need a guide. CYCLOPIC / FRY / OWENS MINES - Turn off Pearce Ferry at mile 16. Dirt road into low hills. Cyclopic is an open pit gold mine. Owens is located on Senator Mountain. Some of these mines are again in production. PATAYA ROAD - The road just beyond the Music Mountain Road turns right across and just southeast of the dry lake, Red Lake. This was an old Indian route that now intersects with Stockton Hill Road. WINDY POINT / PACKSADDLE PICNIC AREA - Turn at milepost 51 off highway 93. Follow road to top. Great picnic and hiking area. Continuing on that road you can hike the 2 mile trail up Cherum Peak. Take plenty of water and plan on a long, strenuous hike up to the top, 6800 feet, and back down. Following the road you find many mines and eventually circle back to Chloride. This is a wild horse range for the remaining herd of 110 horses with bloodlines of the Sorraias horses brought by the first Spaniards. KATHERINE'S MINE - At milepost 46 on highway 93, turn right and follow dirt road to cove. Interesting mine activity to the right going down cut. Turn left before starting down cut and follow road into Katherine's Mine area. Road closed at steep gorge. Very interesting 4x4 drive. Some working mines in the area. MUSIC MOUNTAIN MINES / CLAY SPRINGS RANCH / HELL'S CANYON - Off Antares Rd turn left at first road. Follow road around Willow Canyon Ranch and up a steep, shale-covered road. This is Hell's Canyon and it ends on Hualapai reservation land. Continuing on Antares, the next road is to the Clay Springs Ranch. Continue up the steep grade to intersect the Buck and Doe road. Back on Antares Road, you next come to the Music Mountain Mill along the road. The next road left takes you to many mines, including Ellen Jane, Rosebud, Lucky Cuss, Bonanza King. A steep road leads over the mountain and back to the Clay Springs Road. TODD BASIN MINES - Off highway 93 at milepost 56, turn left. Go around the sludge pond and up the road. Many skeletons of buildings are left. One mine has arsenate crystals covering walls of the tunnel. A guide would help. IRON MOUNTAIN GARNET MINE - Just past the Diamond Bar Ranch turn right on road and follow up the mountain. Ray's Place is still standing with a large apricot tree. Road is washed out very badly. Follow to top - hiking is best. The view of Red Lake is great. Deep garnet mine is on outside of mountain looking onto Red Lake. PETROGLYPH WASH / BONELLI LANDING / JAMES BAY -Turn off highway 93 at milepost 20 (Temple Bar turnoff) and then turn left at Bonelli turnoff. Bonelli is to your right. The turnoff to Petroglyph Wash is to your left on NPS 71. There is a loop road. The road to James Bay is NPS 73. Old Pope Mine is NPS 72. The area has many petroglyphs. FIG SPRINGS - This is on the old Gold road. Leave Route 66 eleven miles beyond the McConnico turnoff, then turn on Navajo - to Garnet - to Dawson...... Dawson is a narrow, rocky dirt road. One mile to the west, against the volcanic rocks, you will find two springs, a marsh, two rock houses, a swimming pool and a rock enclosed yard with a rock barbecue and mesquite and palo verde trees. At the edge of the cattail filled marsh is a fig tree that, according to history buffs, was planted by Friar Garces when he and Indian guides passed through the area in 1776.